I realize I say that after every trip but it always seems to be true, one trip outdoing the previous one. Or maybe that’s simply the magic and mystery of Spain. It always leaves you wanting more. It always leaves you wanting to return. This morning, March 31, 2008, I’m writing at about 7:30am from the train from Granada returning to Madrid. The train is nearly empty. My car has 3 persons including me and the other 2 are asleep. The sun is still down but I can see the embers of an imminent sunrise, a few dots of light on the mountains north of Granada. Just beautiful. Peaceful. 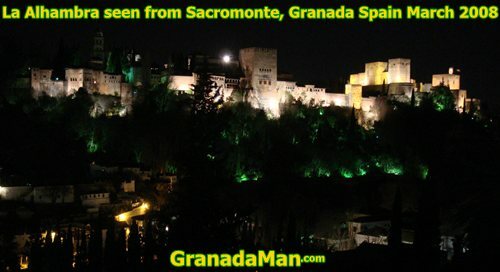 Five nights were planned for Granada but I got a bonus 6th night due to the hour change – without my knowledge. I left Madrid from Atocha train station at about 7:30am last Tuesday, March 25th 2008 and had a fast-moving 5-hour train ride on the standard RENFE train. No high speed AVE trains are in the works for this stretch just yet. I watched the Hollywood movie (in Spanish) and looked out over the countryside. Even went to the cafeteria car once for a coffee but since I’d bought a sandwich in Atocha before leaving I had my late-morning snack at the ready just in case – and I did need it since I ate breakfast at about 5am. Train travel is just the best in Spain – and throughout Europe, as I understand it. I’d traveled the trains in Switzerland, Italy, France, and even Belgium (in the early 1990s) and I never tire of it – unless it’s a long-haul train. Those I don’t like. But a few hours is very comfortable and relaxing. On to the GRANADA TRIP! 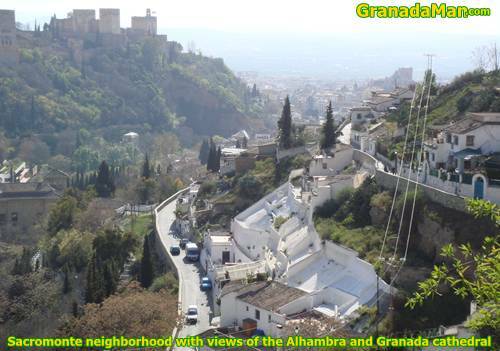 Can ANYONE say enough about the City of Granada? Talk about the epitome of the phrase “Enchanted City”! It has everything, and all without the confines of what feels like a village. 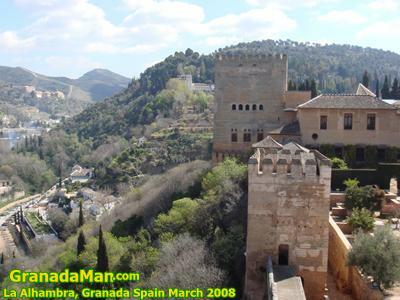 Of course, anyone visiting Granada MUST SEE the Alhambra. That really goes without saying but lots of people, including many Spaniards, believe they can “just show up” and see it – but you really can’t. You can, if you’re lucky, AND if you’re willing to spend hours upon hours waiting in line for the few remaining tickets there MIGHT be available. Pre-ordering/reserving Alhambra tickets online is a MUST DO these days. And even with that you’ll have a long-ish line to COLLECT the actual ticket at the ticket office. I saw people which must have been waiting in line for almost an hour just to get their pre-ordered tickets. My ticket was part of a 5-day BONO TURISTICO card (32.50 Euros, bought at Caja Granada Banks) which not only included entry to the Alhambra but also 9 trips on public buses, entry to the Granada Cathedral, the Granada City SightSeeing bus (good for 24 hours), and a number of other goodies which I didn’t use. All totaled, I probably broke even but since there were no more tickets available online for the Alhambra the only way I could get an entry ticket was to buy the Bono Turístico. And plus, having this card, my line to get my Alhambra entry ticket was only about 10 persons long and took maybe 10 minutes! I felt bad for all those other people waiting and waiting in the other line. I’m not going to do a day-by-day, blow-by-blow, detail-by-detail account of my days in Granada because it would certainly take a good 10 hours of writing. The weather was mostly good while in Granada these days. I think there was one or two semi-cloudy days and a couple of very very cold days. So cold, in fact, that I went out and bought a heavier coat! It even rained last night. Most days were sunny and clear which made taking photos in the Albaycin, with it’s white-washed-walls, so much brighter. The springtime flowers were in bloom but few leaves were on the trees – which I thought odd for late March in southern Spain. It was also very humid and damp most of the time, particularly down along the Darro river, at the base of the Alhambra. Inside the Alhambra was the same, cool and damp but luckily it was a sunny day so the photos turned out nicely. Granada is a city for photographers. There are so many twists, turns, picturesque cobblestone streets, and not to mention the views of the Alhambra from the Mirador de San Nicolas and from nearly any part of the Albayzin and Sacromonte. Sacromonte is a place to be visited. It’s also a place to see flamenco shows in a cave setting. What is “a cave setting?” Caves have been excavated in the hills of Granada’s Sacromonte almost since the beginning of man but the modern caves, those in which people actually live, are rather modern. Most have running water, electricity, and a near-constant temperature. And what incredible views they must have day after day, stepping out into the morning sun with views of the Alhambra and then watching the sunset in the late afternoon. Must be great – but hard at the same time. The caves are usually pretty small – and LOW – and are always up some hill so lots of walking and climbing must be done. Sacromonte is inhabited nearly exclusively by gypsies. The #34 bus – leaving ONCE every hour (roughly on the 25 minute mark of the hour) from the Plaza Nueva – will take you to/near the many Cave Flamenco Shows in Granada‘s Sacromonte as well as to the Cave Museum. But if you’re only going to the cave flamenco shows or to the cave museum it’s actually best to take the #31 from Plaza Nueva, get off at the bus stop just before the Camino del Sacromonte, and walk the 200 meters to these places on the Camino del Sacromonte rather than wait up to an hour for the #34 bus. The Albayzin/Albaicin is much more densely populated than the Sacromonte and also nearly totally inhabited by gypsies but there’s a greater mix of cultures here. Lots of hippies, Moroccan, and other Europeans live in the Albayzin. This is probably my favorite part of Granada. While Granada City feels like a village to me, the Albayzin feels like a smaller village set apart from the rest of the world. The streets are very very narrow, many of them are pedestrian only, it’s very very quiet, and the people are so casual, friendly, and easy going. One must take some caution walking in the Albayzin (and Sacromonte) at night, however. The narrow, dimly lighted twisty streets have yielded some muggings in the past few years – even in daytime – but there’s safety in numbers. 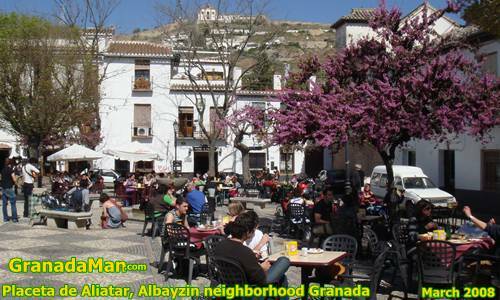 The Albayzin has a number of terraces and squares including the wonderful Plaza Larga, the plaza behind the Mirador de San Nicolas, Placeta de Aliatar (a.k.a. Plaza de los Caracoles), and on and on. All of these have terrace bars where you can sit in the sun – or under and umbrella – and have a cold drink, a free tapa, or have a full lunch or nighttime “copas” with friends. The #31 and #32 buses takes you from the Plaza Nueva down below up into the Albayzin above – well worth the bus fare to avoid the steep walk up the Cuesta de Chápiz. It’s all uphill until you get to the turn-off to go towards the Mirador de San Nicolas (where there’s a bus stop). I went to TWO “Zambra” style flamenco shows in caves in Sacromonte in Granada. One night I attended the 9:30pm show at Venta El Gallo and was entertained for nearly 1.5 hours. The place is nice, comfortable, and they have a dining area and bar areas somewhat apart from the flamenco viewing area. This is a stage flamenco dance show and excellent musical accompaniment. For this one I took the #31 bus from Plaza Nueva to the bus stop (Peso de la Harina) just before the Camino del Sacromonte and walked the 200 meters to the location. There were signs along the way directing me to Venta El Gallo. It’s a nice walk too with FANTASTIC views of the illuminated Alhambra along the way. Wow. 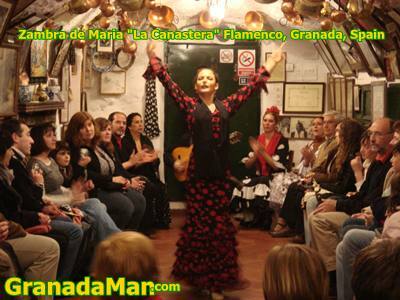 Another night I attended a cave flamenco show at Zambra de Maria “La Canastera”. I wasn’t really sure where this place was on the Camino del Sacromonte but knew there was a bus stop. So for this show I took the #34 bus from the Plaza Nueva – and waited a good 40 minutes for it to arrive – and surprisingly the bus driver didn’t know WHICH bus stop was the one for this flamenco show. How many times has this bus driver taken tourists to these places?? So I found the stop, got out, and to my surprise it was DIRECTLY BELOW the Venta El Gallo cave. DIRECTLY below, mind you, so I could’ve taken the #31 bus and gotten off at the Camino de Sacromonte stop on the Cuesta de Chapiz and walked the 200 meters like I did for the Venta El Gallo show. Had I known…. No matter. I arrived at Zambra de Maria “La Canastera” with a few minutes to spare and the kind gentleman told me to choose a chair at the back so I did, but right in the middle. I was one of the first to arrive, it seemed. But 10 minutes later the place was absolutely full. Busloads of people were filing in and taking their chairs around the floor. This was somewhat different. The flamenco dancing was done in the middle of the cave and people sat around the dancers along the walls. The musical accompaniment brought their chairs in after the last spectators arrived and setup just in front of the exit door. I was kind of happy to be towards the back with people in front of me because I was on a slightly elevated level and could see most dancing feet – but not TOO close to the floor so that the dancers didn’t choose me to dance with them while the (included) drinks were being handed out. I passed on the drink because I knew I’d have one less free hand to take photos and noticed other people having difficulties with this, one glass was dropped and broke, and others were asking people to hold their glass so they could take photos. The show was entertaining and the musicians and singers were great. After both flamenco shows I decided to walk back to the hotel because the slow, cool, nighttime walk along the Camino de Sacromonte, except for the tourist buses passing by from time to time taking their guests back to their hotels, it was peaceful and the views of the Alhambra were spectacular. Plus, the walk downhill down the Cuesta de Chapiz is pretty easy if you can walk in the street because the sidewalks are somewhat stepped and cobblestone and hard on the feet bottoms. Then once at the bottom of the hill you reach the Paseo de los Tristes and the walk along the Darro River with the illuminated Alhambra up above you at all times. This is a magical, romantic stroll at night. I love it. By the time I reached the Plaza Nueva after these nighttime returns from the flamenco shows it was already 11:30pm or later and most all the restaurants and nearly all of the bars were closed or closing so finding something to eat at this time was difficult. What I did most late nights was walk towards my hotel along the Calle Navas for beers and free tapas included. THIS IS THE STREET for tapas bars in Granada. Calle Navas probably has 20 tapas bars, almost all offering 1.50 Euros cañas (small glasses of beer) and a free tapas (of their choice). Most nights I walked through and stopped at three bars, had three beers, and three tapas and I was full. No dinner necessary! Other nights I stopped at FOUR bars. The tapas vary but are usually substantial. I was never simply served a plate of olives or a plate of potato chips like you get in Madrid. In Granada it was always a small sandwich with potato chips, a large place of mixed pastas, a plate of paella, or even a piece of steak on toast with potatoes! It all depends. In all the bars I had a beer (during the day I had non-alcoholic beer to keep my tourist’s energy maintained) only once was I not served a tapa – and that was actually a bodega and not a bar bar although they did serve food. Along Calle Navas, they served a free tapa without fail. The average price for the caña was 1.50 Euros but I had one as cheap as 1.30 and as expensive as 1.80. The food in Granada is good and very similar to that in Madrid. You have your veal steaks, your lomo, your chicken and garlic, your fish (galore!) and seafood, paella, but many many more Shwarma/Kebap fast-food-style restaurants than Madrid has (and Madrid has a lot!). The tapas (free and otherwise) were similar or the same as in Madrid. The breakfasts too were the same. I had toast with olive oil and tomato spread nearly every morning with my coffee. I had my breakfast and 6pm coffee in the same place near the hotel nearly every day. By the 3rd day I’d walk in and they’re say, “Café con leche?”. It’s nice to walk in someplace and to be known, to be recognized. That’s a nice feeling. I always felt like saying goodbye before leaving but they were closed early this morning when I left and yesterday, being Sunday, they were closed all day. 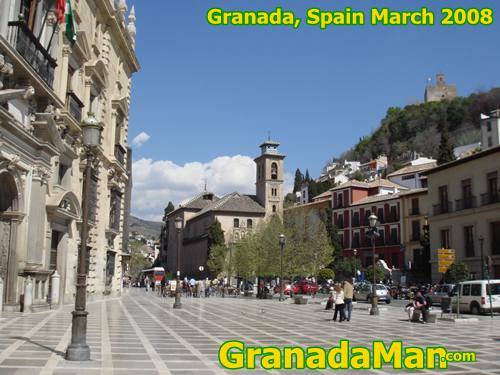 I took two tours in Granada. One, Granada Picnic Tours, Anne, an American woman from Kansas, took a small group of us around the Alhambra, spending roughly 4 hours with us, and giving us all the details about the Alhambra in a very casual, familiar manner. It was a wonderful success and I enjoyed it a lot. I also took the Saturday morning Granada City Hall tour of the Albayzin. This tour was offered by Maria, a Spaniard, and she toured a small group of us around the Albayzin – entirely conducted in Spanish – and filled our heads with thousands of dates, details, poems, and stories of the neighborhood and the city of Granada. It was an educational tour to say the least. My hotel, the Hotel Carlos V, a 1-Star hotel in Granada, is located on the Plaza de los Campos in the Realejo neighborhood – which I REALLY liked – and not only because it was at the end of the Calle Navas but also because it was must more Spanish and very few tourists were seen walking the streets. It’s only a few blocks from the Plaza Bib-Rambla and Plaza Nueva. The 1-Star hotel is located on the 4th floor and one must be “buzzed” in at the front door, similar to hostels and pensions. You walk through a very large foyer to the elevator and walk out on the 4th floor to the hotel lobby. The hotel is quite nice and has about 25 rooms. Being on the 4th floor, (that’ the 5th floor in the USA) all the exterior rooms have wonderful city, mountain, and valley views. The building’s on a kind of cul-du-sac and a kind of garden on another side and a place station on the other side. The Hotel Carlos V was completely renovated a few years ago and every still looks brand new, modern, very clean, key-card door access and electricity activation in rooms, modern bathrooms, and free internet computer terminal in the lobby and free wi-fi in the lobby and lounge rooms and may even reach to rooms further than mine, about 2 doors down the hall from the reception room but it did reach nicely. Breakfast is offered but I don’t know what or at what price as I always went out for breakfast. There’s even a large outdoor terrace/balcony with table, chairs, and great views but neither food nor drinks are allowed in the hotel apart from those bought in the vending machines (snacks and coffee). The bedroom’s bed and pillow was firm and very very comfortable. The bathrooms were modern and free soaps, comb, and shoe-shiner was offered. I used them all. The hotel staff was very very friendly and helpful with anything I asked (extra night, call for a taxi, public transportation questions). The room was even temperature controlled but I didn’t touch it. Language: I spoke Spanish in Granada with everyone and without problem. It was my impression, from overhearing Americans/Brits at restaurants, boarding buses, buying tickets, that few service-persons spoke anything more than a few words of English which is pretty typical. Cash is king. Few places took credit cards except for the larger bars and restaurants. Same goes with the size of the bill with which you’re trying to pay. It’s more difficult to be able to pay with a 50 Euro bill. The terrazas/terrace bars almost never took credit cards. People: The people of Granada, from service people to those on the street all struck me as very friendly. Maybe this was largely because I spoke to them in Spanish. Bonus Day in Granada! : My last day in Granada, Sunday, got up at 8am, got dressed immediately, and went out for breakfast before my 10:20am train departure. LOTS of time. I had to walk a little further to another bar for breakfast since the nearby one was closed. After breakfast I walked to the Plaza Bib-Rambla and sat at one of the rounded lamppost seats to take in the peace and quiet except for the church bells. The city seemed nearly completely asleep. There I was on the plaza, looking up at the Granada Cathedral dome tower against a clear blue sky, when a crooked toothed gypsy man, about 60-something, came up to me asking if I wanted my shoes shined. I’d never had my shoes shined before but these things were desperate for a cleaning after 5 days of dust and dirt and hills of walking around Granada. GREAT! “How much?” “4 Euros.” Perfect! So I sat there, exchanged small talk, and after about 10 minutes he was done. Did a decent job and my shoes did shine but he didn’t use any polish, just a brush, a damp rag, and a dry buffing rag. But fine. They’re still much much better than they were before. I still have plenty of time, strolling slowly up the Calle Navas once again to the hotel. I get in the room, start to undress to take my shower and pack my suitcase when I check the laptop clock. It reads 10:05am!!!!!! WHAT?! I poke my head out into the hall and ask the cleaning lady the time. “10:05am.” ARGH! So I throw on some clothes and head to the reception desk and sure enough, there was a time change the previous/Saturday night and I had NO idea. Here I am in Granada, don’t know anyone and don’t talk to anyone so I hadn’t heard of the change of time. I did look at a newspaper on Saturday and nothing was mentioned. So boom! My train was leaving in about 15 minutes and no way I’d make it so I booked another night. And I was so glad I did! The weather Sunday was perfect, cool, clear skies, and I spent it in walking in the Albayzin. Rather, I was strolling, very very slowly, taking all the twists and turns of each and every street, had a big lunch on a terraza on the Placeta de Aliatar under blossoming trees and with flamenco guitar and singers nearby. It was a perfectly relaxing day – one I’d had lost had I made my train. That day finished off like so many days in Granada, walking down the Calle Navas for tapas and beers, getting to bed early at 10:30pm. The next day, THIS morning, I did have to wake up at 5am to get my 6:45am train to Madrid – from which I’m writing this blog entry now. Hope you enjoyed reading it. I truly enjoyed living it! 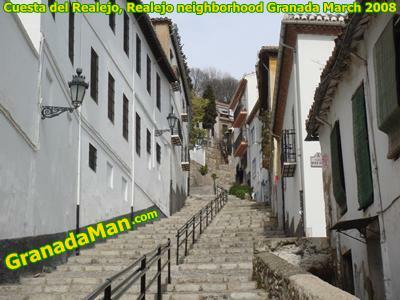 This entry was posted in Travel and tagged Albaicin, Albayzin, Alhambra, canastera, cave, cueva, flamenco, Granada, granada tour, navas, Realejo, Sacromonte, tapas, tours, train, venta el gallo, zambra. Bookmark the permalink.